Just like most glow in the dark things, our glow paintballs emit a green light and you can observe this trajectory as the paintball flies through the night air. These paintballs will glow green after being exposed to a bright light source. These paintballs are ideal for scenario games that feature night games. The bio degradeable clear shell and liquid paint inside Glow in the Dark Paintballs are safe to the skin and have a very long shelf life. The light emitting material is water soluble, no-staining, non-radioactive, and non-toxic. It is the liquid core of the paintball that is light emitting, making an eliminating hit on your opponent easy to detect. The shell of the glow in the dark paintballs clear, allowing the glowing material inside to be easily seen. Keep these paintballs away from water, and in a cool dry place to ensure for a long shelf life. Glow paintballs are used together with a custom designed bright led or UV Hopper to charge the paintballs prior to being shot. The bright or Ultra Violet Light Emitting Diodes and glow paintballs interact to give the paintballs their glow to see the flight path of your shot. 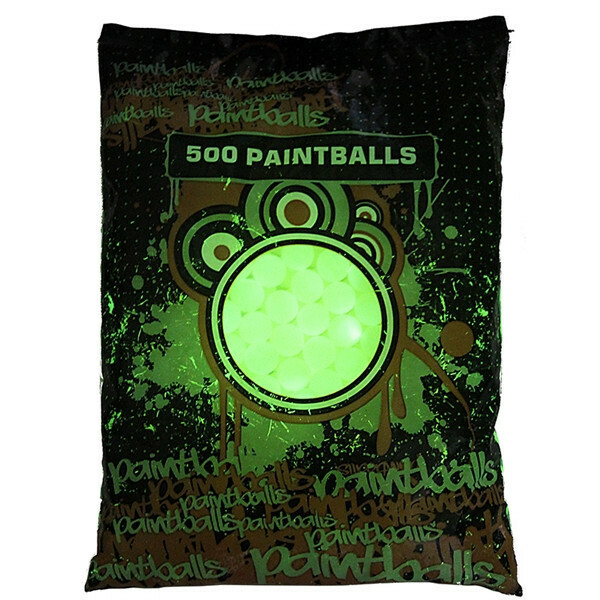 Glow in the dark Paintballs have enhanced the quality of night paintball. With this technology, you can now see the trajectory of your shots, and adjust accordingly if your aim is off. Also, the glowing liquid paint enables you to tell if you have made an enemy kill. With the combined tools of your night vision scope and glowing paintballs, you can locate a target, take the shot and then confirm your hit or whether you need to keep shooting. Not all night paintball fields allow the use of glow in the dark paintballs, but most do. Why Plan Your Party With Planet Sports ? Because we have the best online reviews and all of your guest's FREE smiles, laughs and giggles will make memories that last a lifetime. We had my son's 8th birthday party here. Planet Paintball went all out. They made sure all the kids were safe, had a good time, and even went the extra mile for the parents to have some fun. I would recommend Planet Paintball to any and everyone!